A great point, all told, but disappointing not to claim all three points having led 2-0 with just 15 minutes to go. Bolton have proven on many occasions this season that they are not a team to be taken lightly and following their last home outing resulting in a 5-1 demolition of Newcastle, you’d have been hard pressed to find a ‘Pool fan unhappy with a draw at the Reebok. However, DJ Campbell’s missed chances with the score at 2-0 ended up costing the Seasiders the victory when it looked all but assured. Moving away from the disappointment of not holding onto the win, it was a performance as good as any so far this campaign. For long spells Blackpool were rampant and only their profligacy in front of goal stopped them putting five or six past the Wanderers. Ian Holloway was rightly delighted with how his side played, but which players in particular should be picked out for individual praise? 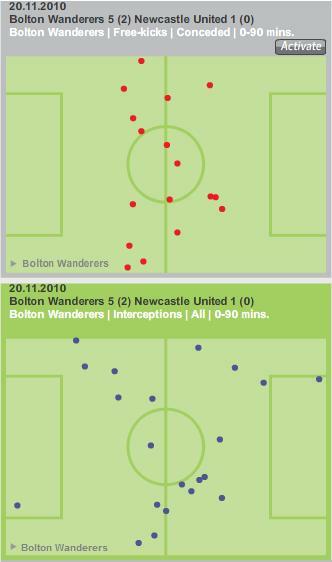 The excellent Zonal Marking highlighted Elliot Grandin’s corner delivery in his weekly article for the Guardian and this was surprising given Bolton’s perceived aerial strength, but credit must go to the management team for their work on the training ground. Scoring goals from set-pieces has not been a hallmark of Blackpool sides down the years, but if this pattern can be continued it bodes well for maintaining the good goalscoring record the Seasiders possess. Elsewhere, I’d like to draw attention to the two full-backs, Neal Eardley and Stephen Crainey. After a rocky start to the season, Crainey has emerged as one of ‘Pool’s more consistent performers and against Bolton he put in another solid shift. The chalkboards above demonstrate how Crainey made key contributions throughout the game. The Scotland international won all of his tackles in ‘Pool’s defensive third with particularly crucial challenges in and around Blackpool’s six yard box. Crainey also made three blocks in the same areas including one goalline clearance as Bolton went in search of the equaliser. I have already highlighted Crainey’s strength in going forward, and when you consider his influence at the back you would anticipate that he has fended off competition from David Carney, for the foreseeable future at least. Turning attention towards the Seasiders’ current right-back, Neal Eardley has largely gone unnoticed. Stepping in for Alex Baptiste since the former Mansfield defender picked up an injury, Eardley has been ever-present (Villa away excepted) and appears to look more comfortable and confident with each appearance. In spite of this, he rarely seems to merit a mention in most post-match discussions. I have been guilty of this just as much as next man, so I’d like to take the overdue opportunity to look at his last couple of performances against Wolves and Bolton. Eardley can find himself a little exposed at times due to ‘Pool’s attacking formation, but by and large he has acquitted himself very well. Matt Phillips started against Wolves and he tends to track back less than others, but under the tough examination of playing against Matt Jarvis, Eardley put in a respectable performance under difficult circumstances. With Gary Taylor-Fletcher back in the starting line-up at Bolton offering more protection in a defensive sense, this enabled Eardley to have one of his best games in a tangerine shirt. Eardley supported Blackpool’s attacks on several occasions. Another aspect of Eardley’s game I’d like to bring up is the long diagonal to the left wing. This looks to be a tactic Holloway likes having employed it both last season and this, and Eardley has at times hit some sensational long passes to Luke Varney and Stephen Crainey. While not always successful, this tactic allows ‘Pool to use the full width of the pitch and has helped make Luke Varney such a dangerous threat. ‘Pool seem to have garnered a reputation for conceding goals, but both Neal Eardley and Stephen Crainey can be pleased with their performances to date this season. The formation employed gives them a lot to do both in a defensive and attacking role, but the pair seem to be adapting well to life in the Premier League. Crainey should be commended for stepping up despite having been written off at this level with former clubs, while Eardley has to be applauded for working his way firmly into Holloway’s plans. Coleman kept the Welshman out of the side last season, Baptiste began this season in the right-back berth and there was also the potential signing of Angel Rangel that fell through. If Holloway had doubts about Eardley, and the aforementioned situations point to this, the former Oldham man must have persuaded the manager that he can be counted upon. Blackpool never make things easy – this we know – and so despite what for large parts of the game seemed a straight-forward victory, another late goal caused a panicky end to a match once more. It may not have been the most eye-pleasing of wins, but it was a vital three points over a side against whom ‘Pool are directly competing with this season. This result puts the Seasiders nine points ahead of both West Ham and Wolves, a sizeable cushion at this stage of the season. What about the performance though? Where did Ian Holloway’s side gets things right, and which areas need to be looked at for improvement? With all the excitement we’ve had at Bloomfield Road so far this season, the first 45 minutes on Saturday was something of a letdown. It could easily be forgotten, given ‘Pool were 2-0 up and seemingly in command of the game, but of the two teams it was the visitors who saw more of the ball in the opening half. Luke Varney’s wonder strike should have given Blackpool the impetus to push on and stamp their authority on the game, but for most of the half it was one way traffic in favour of Wolves. 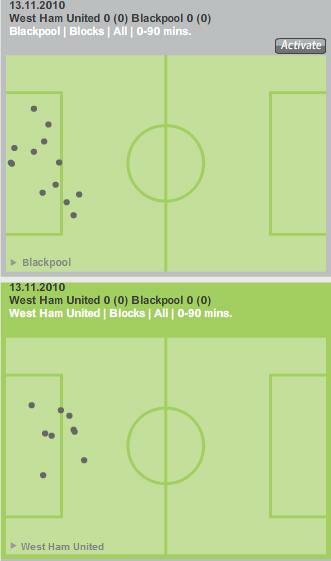 The following chalkboard shows just how busy ‘Pool’s defence was. Over the course of the 90 minutes, the Seasiders made an astonishing 42 successful clearances – the highest they’ve achieved all season. The game at Newcastle was a classic example of a rearguard action, but on Saturday the ‘Pool defence was tested more frequently than at St James’ Park. Ian Evatt and Craig Cathcart put in great performances once again, and were able to restrict Wolves to few clear-cut chances, despite their pressure. Of course while it’s easy to cite good defending, it’s also important to mention how Wolves clearly lacked the cutting edge to break down Blackpool. Richard Kingson had little to do, if anything, in the first half, but did make two good saves as Wolves looked slightly more dangerous after the break. Conceding the consolation goal was disappointing, and will frustrate the ‘Pool defence who had worked so hard to keep their opponents out – Kevin Doyle’s goal actually coming when Ian Evatt was sent from the pitch after receiving treatment, a rule that surely has to be looked at. Why did ‘Pool struggle to get to grips with Wolves then? Mick McCarthy’s side are in an awful run of results, yet despite taking an early lead the Seasiders were outplayed for long spells. Looking at the team picked by Holloway, my instinct is to look at the inclusion of DJ Campbell in the hole ahead of Charlie Adam and David Vaughan and just behind the front three. Elliot Grandin and Gary Taylor-Fletcher have played this role this season with varying degrees of success, but how does DJ compare? 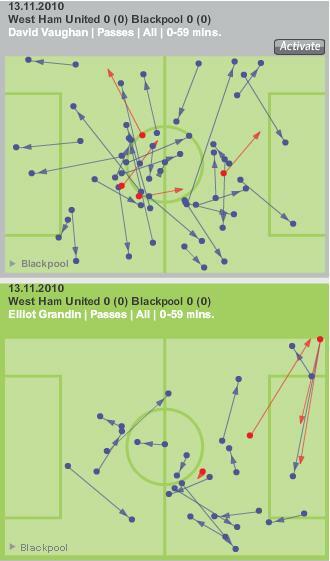 The above chalkboard compares Campbell’s performance on Saturday against Grandin’s versus West Ham. I’ve opted to show only the first 59 minutes, as Grandin was then replaced by Matt Phillips at Upton Park. 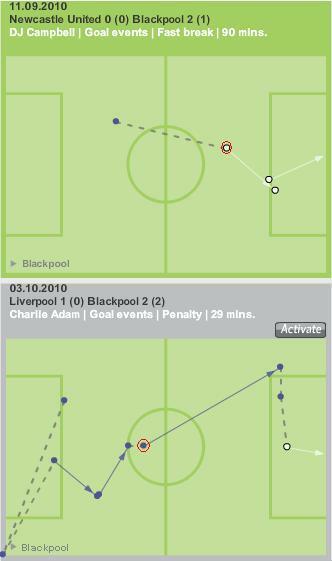 Campbell had little influence at Bloomfield Road, completing only nine successful passes in the first hour of the game, with no impact at all being made in the final third of the pitch. By contrast Grandin looked to have a far bigger role last week, yet this didn’t appear to be enough to satisfy Holloway, who took him off and replaced him with Phillips. This reinforces the view that Campbell is a favourite of Holloway and perhaps ‘undroppable’ – ignoring the unusual selection at Villa Park. 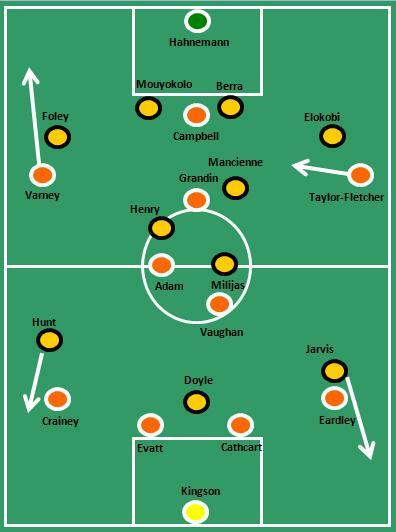 Campbell’s presence in the side allowed Wolves to take control of the midfield, and this will perhaps persuade Holloway to bring back Grandin, or tweak his formation slightly to include Ludo Sylvestre or Keith Southern. Regardless of the performance though, the three points are worth their weight in gold. ‘Pool go into a tricky run of fixtures from now until the end of the calendar year, where points could be at a premium. Holloway will be hoping his defence can continue to perform at their current high level, but has plenty to think about with his more attacking options. Both sides have been praised for their approaches to playing football this season. Blackpool will attack any team and Wolves for that matter too. 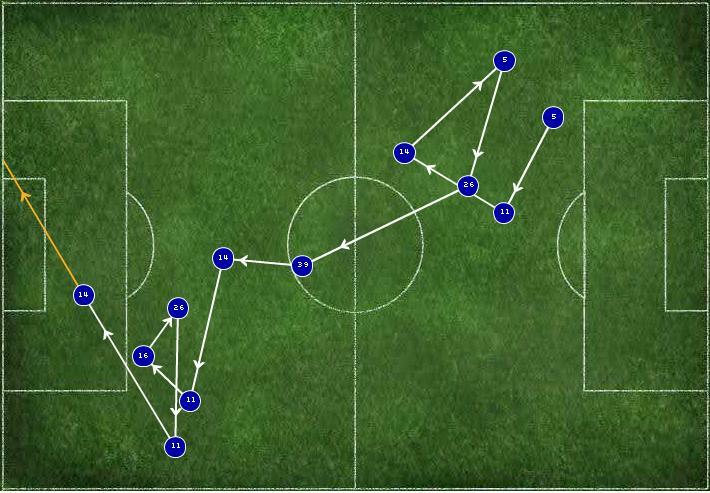 Both sides like to pass the ball about and try and work the opposition out of position. This game could though, come down to the decisions that Mick McCarthy has to make. With exception of Chelsea away Ian Holloway keeps his formation the same, whilst Mick McCarthy has over the past few weeks shown that he will adapt his formation for his opposition. 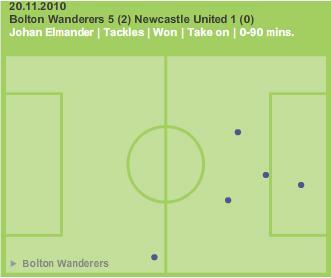 McCarthy last week opted for a 4-4-2 against Bolton and a 4-5-1 against Arsenal in the previous game. Here’s where a critical decision lies, did McCarthy make the call for a five man midfield based on the perceived quality of opposition or did he do it from a counter formation point of view. For example, did he see the fact that Arsenal line up in a 4-2-3-1 and counter that by trying to crowd the midfield. Should Wolves form in to a 4-4-2 then that will be very interesting as either McCarthy doesn’t neccessarily counter the opposition formation or that he genuinely belives his 4-4-2 will overcome Holloway’s modfied 4-3-3. Theoretically, he would be playing in to the hands of Holloway should he go 4-4-2 as that leaves plenty of space for Blackpool to operate in in between the Wolves defence and midfield. This is illustrated below, as Blackpool triangulate their midfield three, with one player at the head (usually Grandin) which leaves Blackpool able to play through the Wolves midfield and for Grandin to float in to space. The way to counter that would be to drop a central midfielder to cover, a centre back to step up or for pressure from Wolves’ two central midfielders on Adam and Vaughan in order to win the ball high up the pitch and set up attacks. The other way for a 4-4-2 to succeed against a 4-3-3 is the way that both Newcastle and Sunderland worked against Arsenal and Chelsea respectively. They pressed the opposition all over the pitch to deny them any space and the two forwards dropped deep to ensure all eleven men were goal side of the ball. If McCarthy brings out his 4-5-1 then that will signal his intent to stifle the Blackpool midfield, who if given space have shown they can dominate teams at this level with metronomic and incisive passing. By packing the midfield with more men, McCarthy will hope to crowd out Blackpool and disrupt their rhythm. However, as with the opening 20 minutes against Arsenal the other week, playing a five man midfield requires an understanding of when to break out to support the forward player. Should the midfield remain static then that isolates the front man and ultimately invites pressure back on to them. 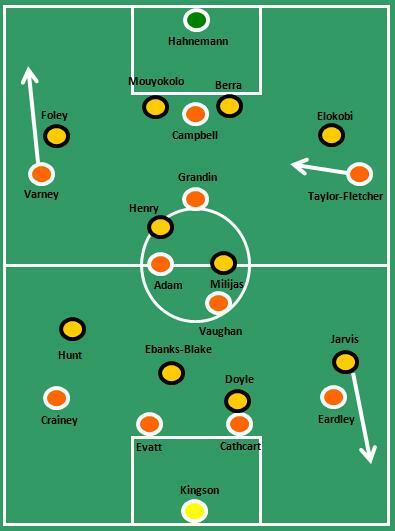 Where Wolves got it right against Arsenal (given that they had enough chances to win the game) was that Milijas eventually realised he had to break out from midfield to support attacks and Jarvis and Hunt got forward superbly on the wings. 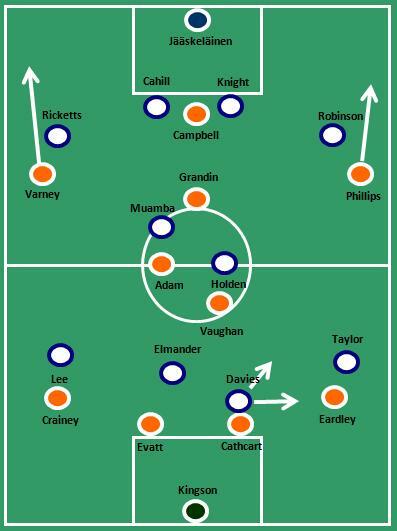 See the image below and how that space that Blackpool had may well evaporate should McCarthy go with a 4-5-1. With a 4-5-1 Wolves could cover the space normally allowed to Blackpool's midfield when they play against a 4-4-2. This leads on to the final dynamic, what should happen if McCarthy calls for a 4-3-3 approach and match Blackpool, this could easily happen as he has the players at his disposal to do so. That would be fascinating, it might well see the likes of Adam, Vaughan, Henry, Mancienne (if selected) forced deeper to cover the central attacking midfielder leaving the most critical battle in the wide areas. Wolves could enjoy that factor given the form of Matt Jarvis and the precise delivery from Stephen Hunt. Holloway may well ask his full backs to site deeper should this happen and if so Blackpool will have to be very careful not to get dragged too deep as a unit and invite Wolves to attack them. Holloway would look to his own wide men for the same and given the pace of Varney and (if selected as most fans are crying out for) Matty Phillips then Wolves’ full backs may well be under pressure. Given the injuries that McCarthy has to deal with in defence then his full back choices may be the most critical. He’ll be aware of the pace Blackpool have in wide areas and will need good mobility from his full backs to nullify the threat. The injuries that McCarthy is contending with may well be critical in this battle. His defensive selections should dictate how his defence plays. If he goes for the likes of Steven Mouyokolo as a centre back then his defence may play a normal to deep line to counter the pace and mobility of Blackpool’s forward line. Likewise Holloway may look at that and think that he needs more physicality against a strong defender and opt for Harewood to start. The problem for McCarthy comes back to the 4-4-2 problem. If he wants his defence to play deeper than normal to cover the pace that Blackpool have then that could open up more space between defence and midfield for Blackpool to exploit. In fact given his defensive options then McCarthy’s formation may be dictated from the back. A less mobile defensive back line that sits deeper might see McCarthy go for the 4-5-1 with one midfielder given the remit to drop in to the space and cover. That was very heavy on theory, looking back at Wolves’ last two games there are a couple of interesting aspects to be aware of. Arsenal appeared to defend resolutely and of course they had an inspirational performance from Lukas Fabianski to thank, but also they defended Wolves’ crosses superbly. 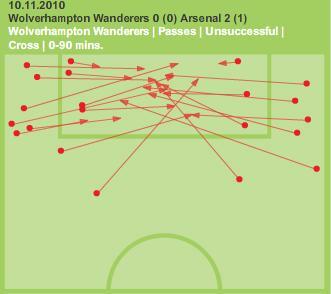 Look below and see the amount of unsuccessful crosses that Wolves’ had. 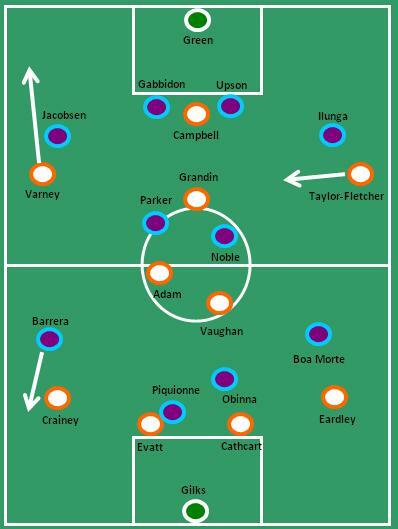 Blackpool will need to do they basics well, cut out the inevitable crosses and clear their back line. Arsenal defended Wolves' crossing very well. Blackpool will need to do the same to avoid being dominated. 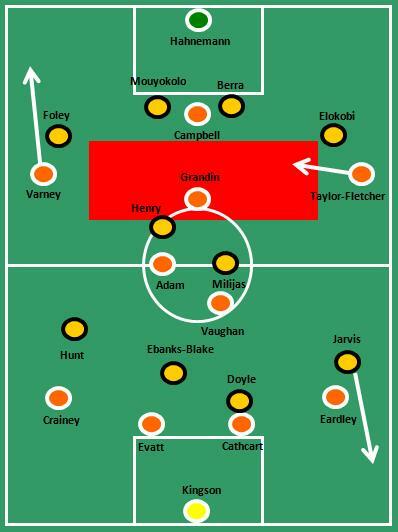 Against Bolton, Wolves, who have a reputation for being tough in the tackle, were out fought in that area by a Bolton team perceived to have ‘gone soft’ under the stewardship of Owen Coyle. Look below at how Wolves were second best all over the park. In fact Gary Cahill and Zat Knight were dominant in the air. Cathcart and Evatt will need to look at emulating that for Blackpool to gain an advantage. 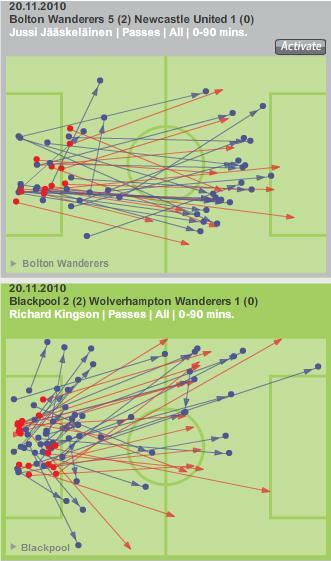 Bolton were dominant in the tackle especially in their own half, this is crucial against Wolves in breaking down their play. So Blackpool will be hoping to win the battle of the tackle and stop the crosses hitting their targets and that may well go a long way to deciding the outcome of this game. Holloway and McCarthy will both enjoy this match up and this is surely what Holloway imagined his work would be like when he got Blackpool promoted. He will hope to counter the decisions that McCarthy makes in order to bring some more Premiership points to Blackpool’s already impressive tally. Head over to the Vital Blackpool Forum to discuss this article with other fans. Quite how this game finished 0-0 is hard to comprehend for anyone who witnessed it, but in the end a point each was probably fair. Both teams will argue they could have won it, and Blackpool did have the better chances (plus the wrongly-disallowed Harewood goal) but a share of the spoils away from home anywhere this season has to be a respectable outcome. What do the stats tell us about the game? I decided to do something a little different this week, and take a look at how some of ‘Pool’s attacks developed at the weekend, using the match action tool on ESPN Soccernet. 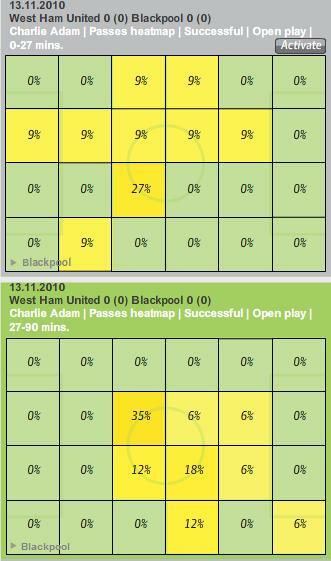 In possibly the most exciting 0-0 draw Blackpool will be involved in for years to come, one aspect of the game was just how end-to-end it was, both teams attacking with pace, taking it in turns to have their go. I’ve hand picked three chances during the game. 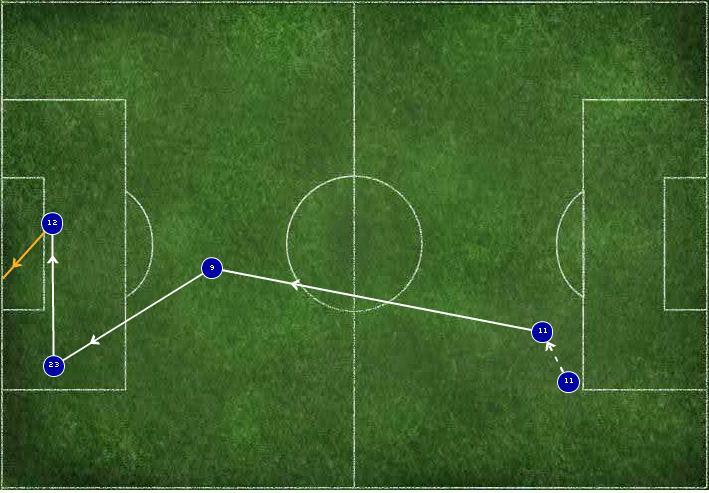 The first example I’ve picked out was Elliot Grandin’s missed chance after seven minutes of the game. Neal Eardley starts off the move at right back, but it’s worth noting how the midfield three of Grandin, Charlie Adam and David Vaughan move up the pitch together at the heart of this attack. Ian Holloway stated in his post-match interviews that the reason Ludovic Sylvestre has yet to break into the team is down to how well those three have gelled, and the above diagram is testament to this. While Grandin has shown flashes of brilliances since signing, some have questioned his end product. In this instance he has done well to get in a forward positions but not for the first time his finishing let him down, making only minimal contact with his head, glancing it well wide. 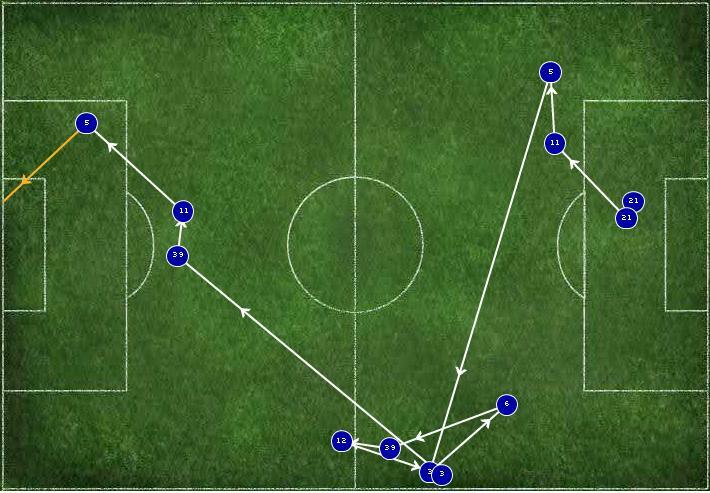 The 11 pass move deserved better, but was a sign of things to come for ‘Pool breaking quickly. This chance involved one fewer pass – 10 overall – and had the ball dropped to a striker rather than Neal Eardley, the deadlock could have been broken. It does help highlight the improvement in Eardley’s game this season however. His long diagonal to the left is one pass in his playbook that he often favours, and the pass early in this move to Crainey is indicative of this. Eardley is also learning to get forward to support Blackpool’s attacks, and he’ll hope to add to his goal against Everton as more opportunities will surely come his way. See also how DJ Campbell was involved in the link up play, not only on this chance on two occasions, but also during Grandin’s early chance. Campbell had few chances himself, but still contributed elsewhere. The glaring miss from Gary Taylor-Fletcher comprised only three passes in the build up, but came at a time when both teams were stretched going for the win. As the space opened up, the chances became ever more regular. With more gaps to exploit, it became possible to break forward within a matter of seconds, as was the case for GTF’s glorious chance. David Vaughan, as he often does, broke up an opposition attack before neatly starting a ‘Pool attack. Matt Phillips, on at this point for Grandin, popped up on the left hand side and calmly clipped in an inviting cross and…well, we all know the rest. 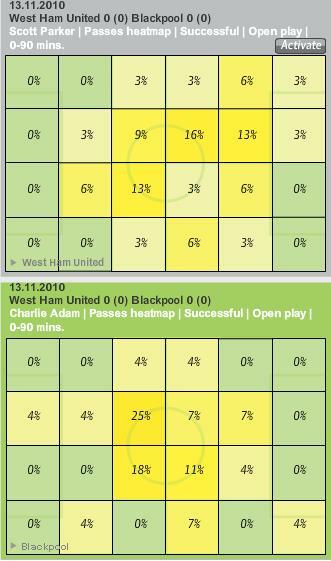 All the above diagrams do nothing to dispel the theory that Blackpool favour attacking down the left – Marlon Harewood’s sitter also came from the left, created by Luke Varney who received a long ball from Charlie Adam. The first two diagrams will certainly please Ian Holloway – they both demonstrate a willingness to progress up the pitch with a mix of short and long passes – and there were plenty of other examples of this I could have called upon. From the other side of things though, West Ham also carved out a number of opportunities where they quickly broke from their own box to have a shooting chance mere seconds later. Next week I’ll hopefully be back to the more familiar Guardian Chalkboards when analysing the crucial match at home to Wolves. As Tangerine Dreaming mentioned in their match review, the game at the Boleyn Ground was a difficult one to analyse from the stats, given the frantic end-to-end nature of the match. I’m hoping I can fall back on the chalkboards next week for a more traditional review of ‘Pool’s tactics.